Brand Awareness – Consider the platforms you use for your video (private IPTV to public YouTube & Vimeo), as well as using video as the medium – video ads, advertising on video platforms and exploiting social video. Improving Response – Evaluate how you use video on your site throughout the user experience – to engage, drive calls to action, convert. Measure for Success – Track, analyse and test all elements of your video strategy, just as you do with all other components of your marketing strategy. 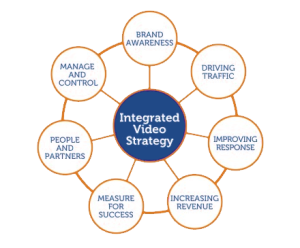 People and Partners – Assess where and how you can use video to train, educate, engage and support your staff, suppliers and customers. Manage and Control – How you manage the production, approvals, deployment and then maintenance of your video assets alongside your other business content.